Bill Gothard called an emergency staff meeting at Headquarters tonight to pray for Michael Scott. "I don't know much about him," said Gothard, "but I'm glad to see the mainstream media embracing the character values we've been espousing for years." One alert staffer suggested bringing Michael Scott to Headquarters for a time of service. "His servant leadership would be an example for all of us," she said. Michael's bumbling season opener about fat people fits in well with Bill's distain for them. His time of service would be worthwhile at HQ, unless his facination with knockers did him in. 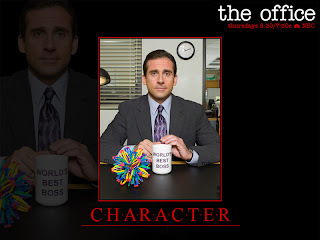 Lol...or Michael's facination with his gf's fake boobies...but I guess if she has other good character qualities, then it all evens out, right? Ooo...or we could just turn the boobies into a character quality...for example, perhaps her uh, assets are her God-given baby-feeders. I can hear Michael making that connection...Let's bring him to IL. I'm all in favor for that...It would def. spice HQ up. Whoever is in charge of this site must be retarded. X-er, I need more! Give us your brilliant, inspired satire! Your people are starving out here! I don't really care if he places updates on this site or not, but if he is not going to post anything, what's the point in keeping it up? Just place a "closed" or "for sale" sign on the page and get on with life...it's okay to give up on something. hey man we need some new posts its been too long. I wonder if Bill has ever seen 40 year old virgin? Oh wait, he is 70 year old vigin. He doesn't need to see it. Actually, the Apostle Paul was a virgin and wrote much of the spiritual guidance and instruction that we have on marriage. Of course, he did write under the specific divine inspiration of Almighty God, whereas Mr. Gothard masquerades as divinely endowed with wisdom while wearing an appropriate facade of humility. But singleness shouldn't discredit a person in itself from teaching what the Bible says on marriage. Such a person should only be discredited on the basis of how their teaching compares to the scripture they're intending to teach from. On that account, Mr. Gothard has discredited himself, not to mention contradicting himself over the years. Oh come on ...... This show is a poor copy of the original Brit version. The apostle Paul was a pharisee and one of the requirements of a pharisee was to be married, so I doubt that he was a virgin. And as such the Apostle Paul has more street cred to give advice to those of us that are married. On topic, having the Michael Scott character do a live Basic might actually persuade me to go to one of those. Oh, Michael Scott reminds me so much of BG... The suit, the spewing of bs with a straight face.... The Office is loads of laugh therapy for me!